Founded in 1976, in Pittsburgh, Pennsylvania, Hyde Industries moved to Sarasota County, Florida in 1985 and has developed many properties, both commercial and residential in Florida over the past 24 years. 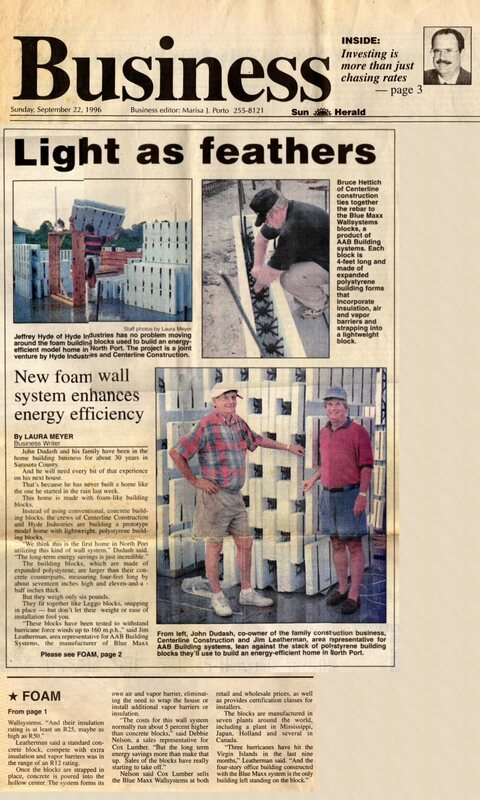 In 1995, Hyde Industries returned to single family home construction after being introduced to insulated concrete forms (ICF's). This has been our sole focus, and over the past 15 years we have refined our process to the point we believe we can offer a home with unparalleled structural integrity. Due to the violent nature of Florida's weather, this type of construction can offer peace of mind to you and your family. In April 2009 we received a certificate of completion for the photovoltaic installers course from the Florida Solar Energy Center (FSEC). Hyde Industries, Inc., will now exclusively build Zero Energy Homes (ZEH). Each home that we build will generate as much electricity as it consumes. Since our homes were already 75% to 80% more efficient than concrete block homes, (2009 code) we were able to accomplish this with very little additional cost on a square footage basis.